The battle for the starting inside linebacker job is one to watch for the Ravens. Both Onwuasor and Correa were rookies in 2016, with Onwuasor being undrafted and Correa a second-round pick, and both played less than 100 snaps last season (60 and 48 respectively). Onwuasor has looked like the favorite to this point, having earned a preseason grade of 82.0 compared to Correa’s 48.6. Onwuasor has been the more effective pass-rusher between the two. In 17 pass-rush snaps, Onwuasor has three total pressures. Correa has just one total pressure in seven pass-rush snaps. 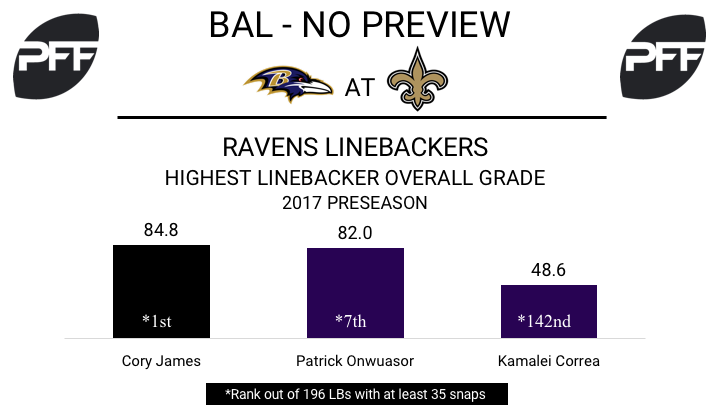 Onwuasor will look to continue his success against a Saints team that cumulatively graded fifth worst in pass blocking a season ago. Larry Donnell, TE – Donnell has played the most snaps of any Ravens tight end this preseason and is the second-lowest graded (69.0). He has, however, earned the second-highest receiving grade out of the group with a mark of 70.3. Donnell will need to step up in the final preseason game if he is going to make the 53-man roster. Jarell Broxton, G – Broxton has been the most impressive Ravens guard to this point, earning a grade of 79.7 through three games, tied for seventh highest among all guards. He has yet to allow a pressure on 30 pass-blocking snaps. He’ll be tested this week by a Saints pass-rush that has cumulatively graded second highest in pass-rushing this preseason. Tim Williams, ED – The Ravens’ 2017 third-round pick is looking like he will be a solid contributor this season. Williams tacked on two more stops and one pressure last week to bring his preseason total to three and four respectively. He also had a batted pass. Look for the edge rusher to play early and often as the Ravens continue to see what they have in the former Alabama standout. Tommylee Lewis, wide receiver – This preseason Lewis has put his best foot forward towards earning a spot on the Saints 53-man roster. 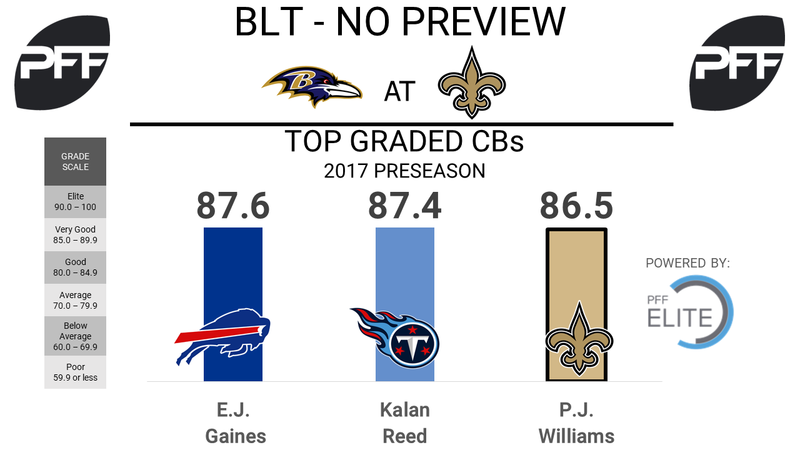 His 77.0 overall grade is the top grade on offense for the Saints. Lewis has been productive this preseason, leading wide receivers in many traditional stats most notably has established himself as a viable option from the slot. Running 47 percent of his routes from the slot, Lewis has caught nearly 80 percent of his targets and produced 1.84 yards per route run. P.J. Williams, cornerback – Williams has proven that he is not only deserving of a roster spot but is a strong candidate to start at one of three cornerback spots, inside or out. Williams put together his third consecutive strong start this preseason starting at slot corner and earning an overall grade of 82.4. On 28 cover snaps he allowed just on reception for negative two yards. Williams also picked up a run stop and a pressure off a blitz. His preseason cumulative grade of 86.5 ranks third among all cornerbacks. Alex Anzalone, linebacker – Anzalone had a major bounce back game after earning just 40.0 overall grade in his first start against the Chargers. This past week against the Texans, Anzalone got the start again and played 32 defensive snaps, earning two stops in run defense, and picking up a pass deflection in coverage. His overall grade of 78.7 ranked in the top-20 among linebackers for the week. Al-Quadin Muhammad, edge defender – Muhammed, a sixth-round pick in the 2017 draft has made a case to be part of the edge rotation this season earning the fourth highest grade on the team. In the team’s third preseason game Muhammad played 25 snaps with mostly the second team defense earning an overall grade of 84.2 which ranked 14th this week among 160 qualifying edge defenders. He produced two pressures including a sack and notched three stops.